It was time for my big heart check-up at the Peter Munk Centre with the UHN at Toronto General Hospital. Having been brought back to life from heart failure in 2016, I had no intention of blowing the incredible work done by Dr. Heather J. Ross and her team in the cardiac ward. However, living in Caledon, with no easy public transportation route down to the Big Smoke, as I loving call Toronto haze in the summer, that proved to be the most stressful part of the day. There was catching the ride to King City, GO train to Union, subway to Queen’s Park and a short walk to TGH. Then I had an Echocardiogram, blood work and my report card from my cardio team ahead of me. That’s when the day got so much better. The staff at TGH from the information desk to cardiac reception were friendly and informative – and this was at 8:00 am! I had arrived early and registered early. The ECHO lab took me right in and my blood pressure was high from the trip down. But that is where I met the first bright light of my day, Laura from Brampton. She was professional, personable and human. People often complain that our health care system is broken and cold. Not here. This young professional was personally engaging, professionally competent. and fully human. An Echocardiogram is like an ultrasound on the heart – it takes time and patience. I went in stressed – I left feeling calm and like I had been looked after with the best of care. My blood pressure was a perfect 110/80. Tayler’s role is to see whether the patient’s condition a year later matches the prognosis. Of course this depends on the ability of the patient to follow the doctor’s good advice. Advice taken. Tayler will give me my report card in one year. I intend to get an A+. We talked for several minutes about her research and how important it was. We talked about life and jobs and how lucky she was to be working with Dr, Ross. And then this young professional, who was so insightful, looked at me and said, “My Dad would like you.” No sooner had I arrived home than I received an email from Dad acknowledging his exceptional daughter. Now, tell me that the personal care and attention provided by our medical professionals isn’t exceptional. 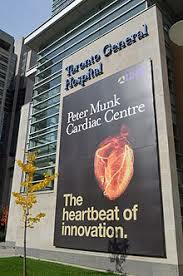 Perhaps the Cardiac Team at the Peter Munk Centre at Toronto General Hospital is out of the ordinary. I know that Dr. Heather Ross is exceptional. Perhaps the entire UHN is exceptional. Then that means we are in good hands. No complaints here. Our cardiac medical teams spend long days and nights, late shifts, and ongoing research to ensure that we live. Like Captain Tom Miller says in his dying breath to Private Ryan, “Earn this, earn it.” I intend to earn it.